AP Photo/B.K. Bangash). 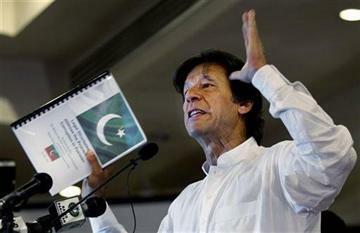 Imran Khan gestures as he speaks about his party, Pakistan Tehreek-e-Insaf in Islamabad, Pakistan. ISLAMABAD (AP) – On the campaign trail in Pakistan, candidates boast about their readiness to stand up to Washington and often tout their anti-American credentials. One party leader even claims he would shoot down U.S. drones if he comes to power. So it’s perhaps no surprise that the government that emerges from next month’s parliamentary election is likely to be more nationalistic and protective of Pakistani sovereignty than its predecessor. As a result, the U.S. may need to work harder to enlist Islamabad’s cooperation, and the new Pakistani government might push for greater limits on unpopular American drone strikes targeting Taliban and al-Qaida militants in the country. But ultimately, the final say on Pakistan’s stance toward drones and many aspects of the relationship with Washington is in the hands of the country’s powerful army. And even nationalist politicians like former Prime Minister Nawaz Sharif, the leading contender in the election, recognize the need for a U.S. alliance and are unlikely to go too far in disturbing it. “I think the tagline here is different posturing, same substance” when it comes to the next government’s relationship with the U.S, said Moeed Yusuf, an expert on South Asia at the United States Institute of Peace. Nevertheless, it’s unclear how long Pakistan’s alliance with the U.S. can remain relatively insulated from anti-American sentiment. The May 11 vote is historic because it will mark the first transfer of power between democratically elected governments in a country that has experienced three military coups. U.S. officials have remained fairly quiet about the election because they don’t want to be seen as influencing who wins. But Secretary of State John Kerry has met Pakistani army chief Gen. Ashfaq Parvez Kayani twice in the last month, underlining the importance of the relationship to Washington. The U.S. needs Pakistan’s help in battling Islamic militants and negotiating an end to the war in neighboring Afghanistan.The relationship has been severely strained in recent years, especially following the 2011 raid that killed Osama bin Laden near Pakistan’s equivalent of West Point. But it has never broken down completely and has settled into a wary calm over the last year or so. Trust is still in short supply, but both sides recognize they can’t do without each other. Pakistan’s relationship with the U.S. – and foreign policy in general – has been less of a focus in the election than domestic issues, such as corruption, pervasive energy shortages and stuttering economic growth. Lodhi believes this is because the U.S. has said it is largely pulling out of Afghanistan by the end of 2014 and is seeking a peace settlement with the Taliban – a move long advocated by the Pakistani government and supported by the main contenders in the election. “That has helped to take the edge off negative sentiment in Pakistan which we saw in the last couple of years against the United States,” Lodhi said. One issue that continues to create tension between the two countries is the U.S. drone program targeting Islamic militants in Pakistan’s rugged tribal region near the Afghan border. The attacks are extremely unpopular in Pakistan. They are seen as violating the country’s sovereignty, and many people believe they kill mostly civilians – an allegation denied by the U.S.
Pakistan’s civilian and military leaders have contributed to these perceptions by criticizing the strikes in public in the past, while supporting them in secret. This support has declined over time as the relationship between the two countries has worsened. The number of strikes has dropped from a peak of more than 120 in 2010 to close to a dozen so far this year, but it’s unclear how much this trend has been driven by U.S. decisions about targeting versus the political sensitivity of carrying out strikes. Khan, the former cricketer, has sharply criticized U.S. drone attacks and has even pledged to shoot down the unmanned aircraft if he came to power. 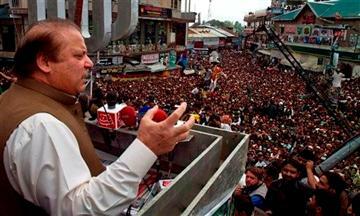 Sharif has also been a vocal opponent of the strikes in the past, although he hasn’t made them as much of a focal point of his campaign as Khan has. Nevertheless, Daniel Markey, a South Asia expert at the Council on Foreign Relations, believes Sharif would work with the army to renegotiate the use of drones in Pakistan if he took power. However, Lodhi, the former ambassador, has doubts Sharif would pick a high-profile fight with the U.S. over drones since the number of strikes has decreased so much. This entry was posted on Friday, May 10th, 2013, 2:06 am and is filed under Makaar Dushman, Nawaz Sharif US Agent, Pakistan Security, Pakistan Security and Defence: Enemy & Threats (Internal & External), Pakistan-US Relations, Pakistan-USA Relationship, SPYING ON PAKISTAN, THE NEOCON STRATEGY IN PROCESS, US Drone Attacks. You can follow any responses to this entry through RSS 2.0. Both comments and pings are currently closed.